When I say the word “Fly”, you probably do not imagine brightly colored, harmless Flower Flies feeding on flowers in your garden. Their larvae spend the night voraciously eating aphids on your garden plants while you sleep. By modifying a few gardening practices, you can encourage this natural pest control and have some amazing creatures visiting your flowers. 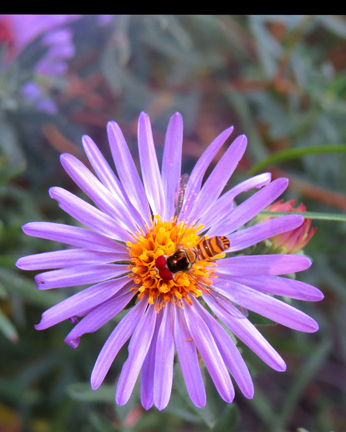 Flower Flies are also called Hover Flies, Drone Flies, and Syrphid Flies. They belong to a large family of harmless flies called Syrphidae. Most are colored to mimic bees and wasps. When you are a helpless creature, like a fly, living in the tough neighborhoods that are our backyard gardens, it helps you survive to look like a bee or wasp. Predators are more likely to avoid you. At first glance, it is easy to mistake a Flower Fly for a bee. 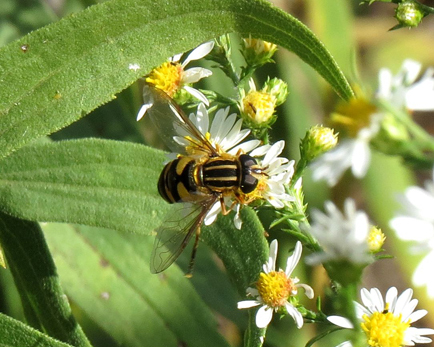 You can identify a Flower Fly by several characteristics. They have short, knobby antennae. Their eyes look like goggles on the front of their head. They have two wings and each wing has a characteristic fold on the front edge of the wing. Bees have long antennae, eyes on the side of the head, and 4 wings without a fold. Adult Flower Flies live 3 to 9 weeks. They feed on nectar and pollen using their sponge-like mouth parts. Females seek out plants with larva prey to lay their eggs on. Larva hatch out in three days. The grub-like larva consume aphids, spider mites, thrips, scale, and mealybugs. They usually feed at night and have quite an appetite. They can consume as many as 50 aphids in a night of feeding! Once mature, the larva spins a simple cocoon and attaches itself to a leaf or plant stem. In this pupa form it develops into an adult. Flower Flies overwinter under leaf litter or on plant stems as either a larva or pupa. and the native Black Eyed Susan, the native False Sunflower Heliopsis helianthoides, and Panicle Hydrangea blossoms. The fall species feed on the native Rigid Goldenrod, Smooth Aster, and Aromatic Aster. Flower Flies feed on flowers from May to early November. To have a good population of Flower Flies you have to allow them to overwinter. The adults die at the first freeze. The larvae and pupae overwinter under leaf litter or on plant stems. 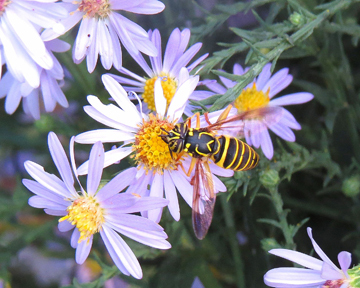 If you remove plant stems and debris in the fall, you remove many of next season’s Flower Flies. Allow some plant litter and stems to persist in your garden until it warms in the spring. If you want to clean up parts of the garden for appearances sake, place the garden debris in the back of the garden or the back of the yard or under bushes so next year’s adults can emerge in the spring and summer. If you will minimize or eliminate your pesticide use, you will benefit all the wildlife in your garden and allow the natural predators, like Flower Fly larva, to increase in numbers so they can decrease the population of damaging insects. 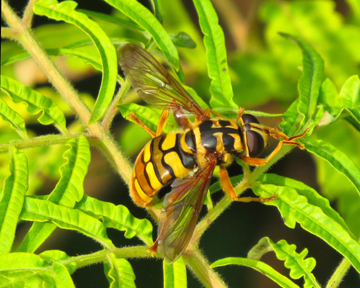 There are a couple of interesting things to observe about Flower Flies visiting your garden. One is that the male flies have eyes that touch at the top. The females have a space between their eyes. Another is some of the species hold their front legs in front of their head and wave them to imitate the long antennae of wasps. I realize that “Gardening For Flies” may never become a hot topic in the gardening world but by planting a variety of open flower form plants, allowing some garden debris to persist over winter, and minimizing pesticide use, you can benefit from the natural pest control and beautiful visits of Flower Flies. Tom Schroeder is a Missouri Master Naturalist intern and a volunteer for Kansas City Wildlands. Kansas City Wildlands is an organization focused on restoring and managing the remnants of original landscape in the Kansas City Metro area. Visit their website at https://www.bridgingthegap.org/kansas-city-wildlands/.